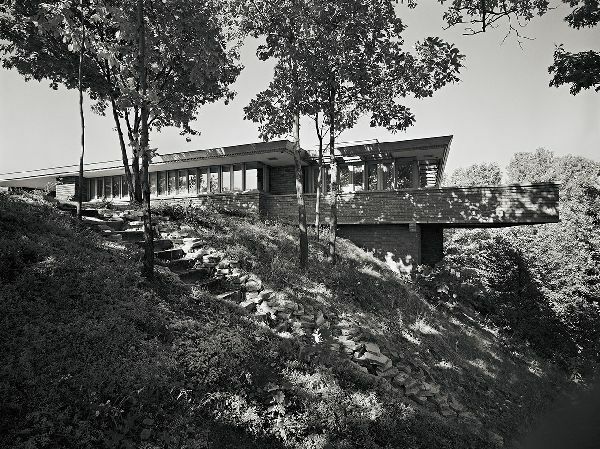 Carl Schultz’s second wife, Betty, was the driving force behind approaching Frank Lloyd Wright to design their new house. Schultz founded and was President of Laboratory Equipment Corporation, St. Joseph and Benton Harbor Malleable Industries. In the mid-1950s, the local businessman purchased the D’Andrea house in St. Joseph, Michigan. 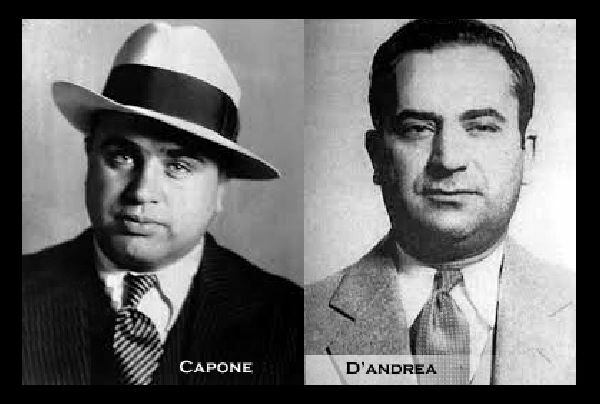 The lavish house at 1107 Highland Avenue had been built in 1933 by Philip D'Andrea, Al Capone’s bodyguard and trusted advisor. Schultz subdivided the property, which at the time included a house and orchard, into a dozen residential lots. He retained 1.75 natural acres that included a steep ravine and scenic views of the St. Joseph River for the construction of his new residence. “When I was a junior in college I had the occasion to visit the Goetsch-Winkler house in Okemos, Michigan. Ever since that time I have hoped that one day I might live in a Wright house. My husband and I own a nice lot situated on the St. Joseph River and bounded on the north by a large, deep ravine and are considering building sometime within the next few years. To state our position briefly, we have four children (two boys and two girls) and about fifty thousand dollars. We realize our prospects would be brighter if we had fewer children and more dollars. However, our situation being what it is, we can’t help hoping that you still may be able to do something for us. 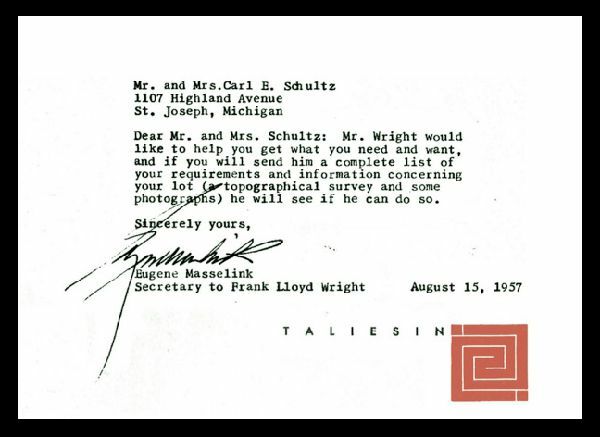 Wright accepted the commission later that month. The design contract was for 4% fee on proposed $75,000 cost of house. After rejecting an earlier proposal from Pearson Construction Company, Benton Harbor, dated May 19, 1958, to construct the house for $126,500, Schultz accepted a construction proposal of $79,000 from Zeiger Lumber Company, Sawyer, Michigan. In July 1958, construction on the house began. William Wesley “Wes” Peters oversaw the construction for Wright. Peters was married Wright’s adopted daughter and after she and their son died in a tragic auto accident, Peters was later briefly married to Svetlana Alliluyeva the youngest child and only daughter of Joseph Stalin. The chief architect for Zeiger was Earl Hill. The house was completed in the summer of 1959, just a few months after Frank Lloyd Wright’s death in April of that year. In 1963, Carl Schultz commissioned Taliesin Architects to design a house on an adjacent parcel as a wedding gift for his daughter, Elizabeth. Wes Peters was the architect. 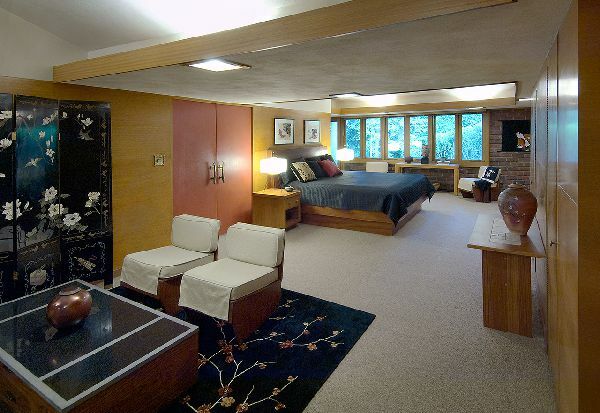 Shortly thereafter, Taliesin Architects designed an addition to the Carl Schultz house which expanded the Master Bedroom and bath.